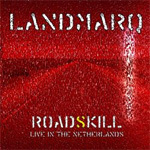 Continuing their 25th anniversary celebration, Landmarq delivers their long-awaited live CD and DVD, Roadskill. The audio and video recording is from the 2013 tour, filmed at De Boerderij in the Netherlands. Suffice to say, if you're a Landmarq fan, you will love every part of this audio/visual presentation, and I would encourage you to buy the package forthwith. Otherwise, having said that, I'll make a few observations and comments, speaking to the DVE in particular. First, the sound of Roadskill is nearly immaculate, perfect in most every way. Which makes me wonder, what's up with that. I'm not complaining, but I wonder what was done during or after the filming/recording. Maybe it's just being professional and rehearsing enough. It's almost too flawless. Nevertheless, the warmth and passion of their music comes through. Regarding the actual filming, you get a good breadth of camera angles: wide shots for the band in full song performance, close ups of individual musicians whether during solos or not. Also of interest is how spartan the Landmarq stage plan. Drums and keyboards are on risers, everybody else on the deck. Minimalism seems the key to efficiency and expression. Concerning expression, excepting Tracy Hitchings' moderately charismatic presence and vocal stylings, the band seems content on holding place and keeping the music the focus. Not a big deal, but there's not a lot of audience engagement either. Regarding the song selection, as you would suspect from a tour in support of an album, the majority of the material is from 2012/2013's Entertaining Angels. For the longtime, diehard fan, they may have wished for additional earlier material. There is a slight two song difference between DVD and CD. Bottom line, again, this is a fine presentation, as good as gets if you can't get to a live Landmarq show. Easily recommended. Suffice to say, if you're a Landmarq fan, you will love every part of this audio/visual presentation, and I would encourage you to buy the package forthwith.